The deluxe apartment offers a living surface of 70 m2. It features kitchen, kitchenware, shower, wc, air conditioning, TV, wi-fi, refrigerator, balcony, telephone, elevator, pool, table tennis, fitness equipments. The apartment is situated in the center, at 150 meters to the sea, at 500 meters to entertainment centers, near Keykubat Beach. 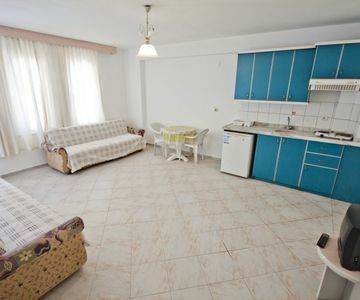 The apartment is situated at 800 meters to seaport, Kizilkule and Alanya Castle. The charming apartments offer sea, mountain and castle view.